Serving scaled images is one of the most overlooked ways to deliver a better site performance. Are your images holding your site back? Images take up a lot of file size space, especially if they’re bloated and oversized. That’s why images should be number one on your list of things to optimize if you’re trying to improve page speed, conversions or sales. 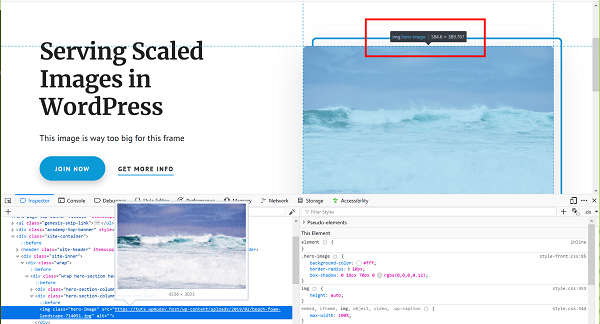 In this post we’re going to focus on how to serve scaled images with WordPress. You’ll learn how to properly size images in WordPress in several different ways and how to improve your image optimization workflow tremendously with Smush Pro. Images on the web have to fall in the Goldilocks zone. Not too big, not too small. They have to be just right. If they’re too small and they are scaled up, they’ll be blurry. On the flip side, if an image is too big, the browser will shrink it down to the right size. This doesn’t affect how the image looks, but it will add to the file size of the page. Since you can’t see a change in quality, the extra weight on the image files becomes easy to overlook. And since most people don’t know there is a problem, they don’t fix it. They go on relying on the browser to serve up the right size, because that’s what the browser is for, right? 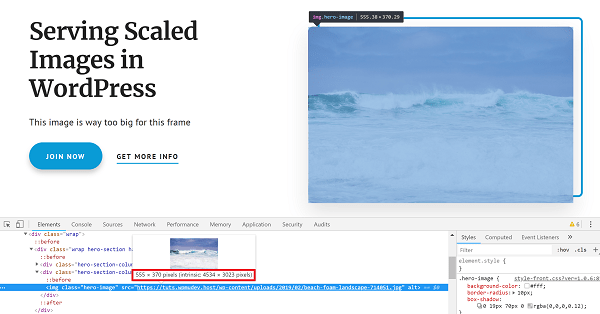 When you get a “properly size images” opportunity in Google PageSpeed Insights, you’ll know it is time to scale some images. Delivering an image that is too large hurts you in several ways. One, it distracts the browser forcing it to perform additional server requests. Instead of delivering a webpage as fast as possible, it needs to stop and resize the image. That takes time my friends, especially if your webpages are image heavy. Second, if you’re uploading a full size selfie straight from your phone, but you’re displaying it as a small Gravatar, then you’re wasting time and data downloading an image that is excessively large. 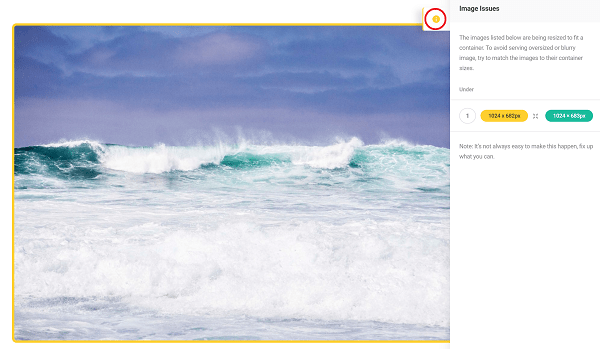 An example suggestion in Hummingbird to compress and resize an image. Enter scaled images. A scaled image is an image that has been sized to fit the exact dimensions you’re using it for. Unlike cropping, which may ultimately alter the proportions of an image, scaling preserves the dimensions. If you’re reading this post on a full size screen, then the body of this post has a width of 600px. Since we’re all about optimization here at WPMU DEV, when I create images for blog posts I make them exactly 600px wide. That is the exact size I need so the browser doesn’t have to do any additional work and so you don’t have to use more data. Site speed optimizers such as Hummingbird, GTmetrix, and Google PageSpeed Insights will recommend scaling images to improve performance. Aren’t the srcset and size attributes supposed to take care of image resizing? Yes and no. You want peak optimization right? If you do, srcset and size will help you get closer to the ideal image size, but won’t always give you the exact size you need and it won’t cut the excess on the largest size. Above, WordPress is telling the browser, you know more about the user than I do, here’s the image you want in 3 different sizes, choose the one that will work best. When the browser needs to display a 75px x 75px Gravatar next to a comment, it will choose the first option in the set and resize it slightly. If the user has a retina device, it will choose the second option. This cuts down on some waste, but scaling will allow you to get that extra bit of performance. To get started, you need to know the dimensions of the images that will be used on your site. I’m talking banner images, hero images, blog post images, Gravatar etc. Watch our quick tutorial on how to detect incorrectly sized images in WordPress. We want to know what is the largest size that each image will ever be displayed at since we know that everything over this threshold is useless. For example, let’s say I want to use a photo of the ocean on my site’s home page. The image in its unaltered state is 4534px x 3023px. For an image in the body of a blog post, you’ll probably need to serve an image between 600px-960px wide and for hero featured images that span the width of a desktop computer screen, you’re looking at something in the 1600px width range. Also keep in mind that you’ll need to double these sizes to accommodate retina screens. The largest size that 1600px image will need to be is 3200px. To find the size that the image needs to be in order to fit perfectly, we’ll look for the image on the site and open up the browser developer tools. If you’re using Chrome, right-click on the image and go to Inspect. In Firefox, select Inspect Element. In Chrome, when you hover over the URL for the image, you’ll see the size that the image is displayed at with the original “natural” image size in parentheses. That large image file is what your visitors are downloading. The image is over 3000 pixels too large, what a waste. This is similar in Firefox. Once you inspect the element, you’ll notice that next to the image are the dimensions. Now that we know what size we need the image to be, we can resize images properly in WordPress in several in different ways. To manually crop an image, go to Media > Library and click on the image you want to crop. Then, click the Edit Image button to open the editing interface. View an image’s attachment details, then click the Edit Image button. Scale or crop the image as needed using the corresponding options on the right. Keep in mind that if you scale the image to match the width you need, the height may be shorter or longer than the defined size in your theme depending on the dimensions of the original image. If you choose to scale your image, it remains in proper proportion relative to the original image. On the other hand, if you decide to crop your image, it may not necessarily end up being edited proportionately depending on the dimensions you choose. You can either scale your image by typing in your desired width and height, then clicking the Scale button or if you prefer to crop your image, you can do so by clicking and dragging your mouse over the image and selecting the area you want visible. Then, release your mouse click to reveal your selection. You can click and drag the squares on the edges and sides to make any necessary adjustments to the width and height or you can enter the exact dimensions you want into the Selection field on the right. The aspect ratio is the relationship between the width and height. You can preserve the aspect ratio by holding down the shift key while resizing your selection. Use the input box to specify the aspect ratio, e.g. 1:1 (square), 4:3, 16:9, etc. You can also click and drag your selected area to move it to the exact area you want visible. If you cropped your image by selecting an area of it with your mouse, click the crop icon above your image. Scale or crop your image to fit the size defined by your theme. Next, choose which pre-defined image size where you want your changes to apply under Thumbnail Settings. This option can be helpful if you want to edit the image while preserving the thumbnail. For example, you may want to have a square thumbnail that displays just a section of the image. When you’re done making your changes, click the Save button below your image. Select which image sizes where you want to apply your resizing, then click Save. You can also manually resize your images while you’re editing a post or page by clicking on the Add Media button above the editor. Then, click the Media Library tab and choose one of the listed images. Next, click the Edit Image link to the right to access the same editing interface mentioned above. You can also manually resize an image while editing a post or page. How does WordPress Resize Images with the Media Settings? If the images you need to manually resize are the default sizes WordPress creates, then you can try editing them via your admin dashboard’s Media Settings. The default WordPress image sizes are thumbnail, medium, large and full-size, though, full-size refers to the original dimensions of uploaded images and can’t be changed in the Media Settings. To edit the original image, refer to the details above. To manually resize the default image sizes, go to Settings > Media and enter the max width and max height you need for the applicable image size you want to change in the corresponding fields. 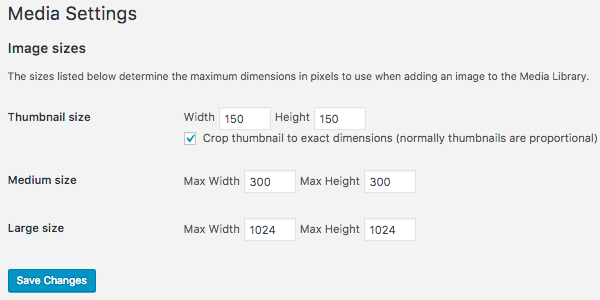 If you need to change the thumbnail size, you can also optionally keep the check box selected to crop the thumbnail to the exact dimensions you specify. Normally, thumbnails are proportionally edited automatically. You can edit the default WordPress image sizes through the Media Settings. Keep in mind that these sizes can be used in multiple places in your theme so you may end up editing images that you don’t want resized. You can also add custom sizes to WordPress. Once you have saved your changes, install and activate the Regenerate Thumbnails plugin to resize the images you have previously uploaded to adhere to the new dimensions you just set. Open up your image in Paint, Adobe Photoshop or your image editor of choice. We’ll use the dimensions we came up with in the Developer Tools. 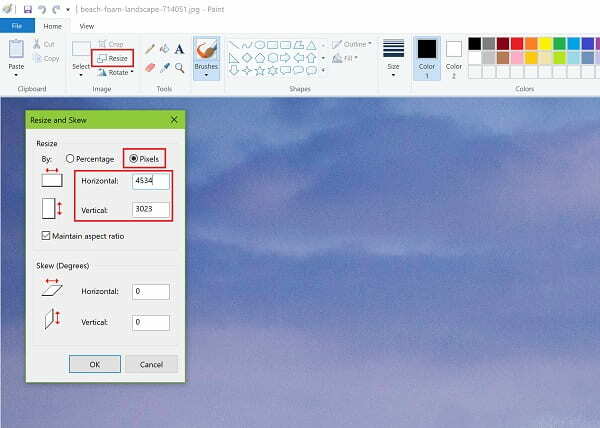 In Paint, go to resize in the home tab. A box will open that will allow you to enter the new dimensions. Select the pixels radio button and then edit the horizontal dimensions. The vertical dimensions will automatically be resized if the maintain aspect ratio check box is selected. That is what we want. If the box isn’t checked, you’ll need to do the math yourself. When you’re done adjusting the dimensions, click ok. Then you can save the file in Paint, re-upload to WordPress and replace the image with the new file. Smush and Smush Pro can save you a lot of time when you start optimizing your images. Both Smush and Smush Pro have an option for wrong size detection in the plugin settings. If you’re like me and forget to resize your images every once in a while, this feature will help you see which images are slowing down your site. When you visit your site, images that are either too large or too small will appear with a yellow outline. When you open the information tab (see the yellow “i” icon?) Smush will let you know what is wrong with the image size. Thanks Smush! To enable this feature in Smush and Smush Pro, go to plugin settings and in the Image Resizing section, enable Detect and show incorrectly sized images. Then save your settings to see incorrectly sized images on the front end of your site. Want to keep yourself and others from uploading super humongous images so you won’t eat up so much of your hosting storage space? Smush and Smush Pro can help. 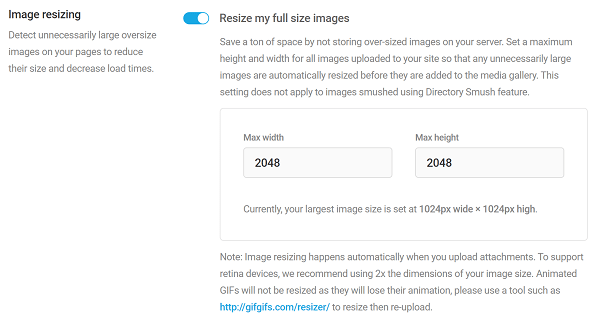 In the Smush plugin settings, head to the Image Resizing section and enable Resize my full size images. Before an image is uploaded to your media library, Smush will resize it to fit the width and height you specify. Notice how Smush tells you what the largest size image on your site should be and then doubles it for Retina devices. Smush also gives you the option to keep a copy of the original image. This feature essentially cuts the excess off your largest image. But what if you want to get all your uploaded images to be the perfect size without having to go through the steps above and scale every image manually? 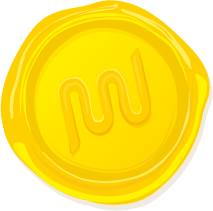 Easy, become a WPMU DEV member and get access to Smush Pro’s lightning fast CDN. 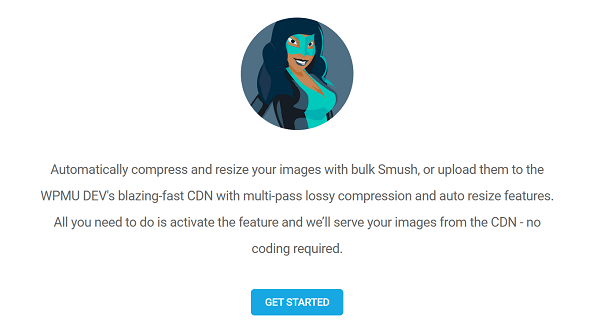 While your host may include a CDN with your hosting account to improve the performance of your site, Smush Pro’s CDN was designed specifically with image optimization in mind. Not only will the Smush Pro CDN deliver your images at lightning fast speeds, our CDN will also serve up the perfect size image for your users. In other words, leave the scaling to us! 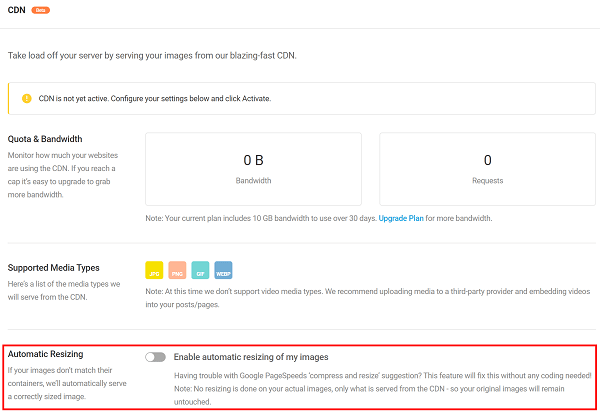 The Smush Pro CDN can even help you if you’re having trouble with Google PageSpeed’s ‘Properly size images’ suggestion. After pushing the Get Started button, you’ll reach the CDN configuration settings. Just enable the automatic resizing option and the CDN will deliver the right size image for you while keeping your original images untouched. How’s that for cool? As you can see, there are multiple ways to properly size images in WordPress, but it can be a tedious process if you have a mature site with a lot of images. Rather than throwing your hands up and saying, “oh well that’s the user’s problem” and leaving your images as is, I suggest using a plugin like Smush Pro to solve the problem in five minutes instead of five days. You can sign up for a free trial here to use Smush Pro for free. Your users will thank you. And you’ll probably see lower hosting costs since you won’t need so much space. If you haven’t taken a look at Smush in quite some time, it’s time for a revisit. Get a 30 day free trial here. We’ve added a lot of new features and Smush Pro is way more powerful that before. Smush Pro was already the leading image optimization plugin, so that’s saying a lot. Check it out, you won’t be disappointed. What tricks are you using to resize and compress your images? Have you tried WP Smush Pro to scale your images? Share your tips in the comments below. It would be interesting to get some thoughts/advice when using themes that intentionally place a bigger image in to a smaller container, as the theme uses HTML5 scaling and/or panning effects as part of its visuals. It seems that you are asking about parallax images. When a large image is put into a small container it is there to create an effect. The effect they want to create/simulate is movement. It is great for adding interest to your website. Yes I realise that, thanks. However such effects score poorly in hummingbird and google tests. Due the images being flagged as “resized”. I’ve expressed confusion on this topic in two other recent blogs. I need to go carefully through this article and the others (and the awesome/fast comments from WPMU DEV Support). Then go back to some general reading on WP media fundamentals. I think this all will finally give me the understanding I need to be able to select, size, and compress specific images for specific post/page locations in specific themes. Wow, there is a lot of homework to do on this topic. It’s just tough to recognize what’s being done for us, what options are readily available (as in, when images are copied and resized, per this article we need to be able to get WP to use the right-sized image), and where we need extra code via plugin or child-theme mod to force what we want under specific conditions. There’s definitely a lot to get your head around! And yes, do ask our support team if you have any questions! This does not sound right. Can you please pop into live support so our tech team can take a look at this. What about where we use a responsive layout and images are resized dynamically based on the size of the screen? I would rather not reduce an image size to optimise for a smaller screen at the risk of a poorer image quality for the larger screen sizes. As a general rule, reduce the dimensions to the smallest size that will render properly on your target devices. So, if the smallest image you can use is 1920px and still render properly on Desktop, then use that. Where the problem arises is when you use a 1024px image in location that, even on desktop, only needs a 800px image, but is resized using HTML, CSS, or JS to fit the container. Without performing some heavy coding to detect the device viewport and supplying the correct image for that viewport, if you’re going to do responsive design, there will be some concessions to make. It’s a balancing act. What about images used for lightboxes? I use Smush Pro and get yellow lines around smaller images that when clicked open the larger image in lightbox. Smush tells me to size the image for what is being displayed (let’s say 480p x 300p) but the lightbox is set to show image at 800p width. Should I ignore the yellow lines? resize for lightbox? Resize for display size? Hi BobfromCA and thanks for your comment. Could you start new ticket or chat here https://premium.wpmudev.org/hub/support/#get-support so we can check your setup and see what exactly is reported by Smush and what would be the best approach to resolve this for you? Good stuff guys. And Micah is the perfect guy to make the type of video like the one in this post about detecting incorrectly sized images. I bet there’s more videos coming about many other aspects of various DEV plugins. 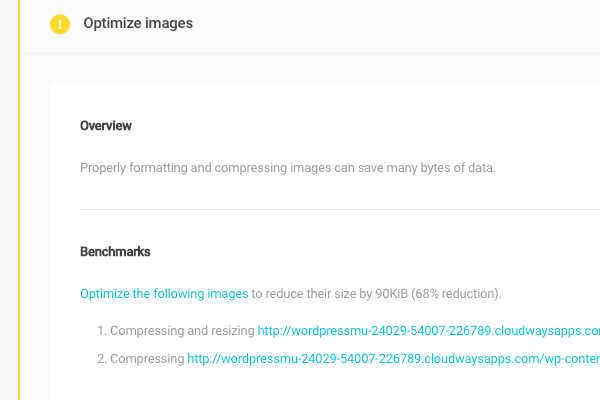 Image compression really helps in speeding up a WordPress, I got this tips from WPblog and over the years it really helped me to speed up my website. Could you give us more info about using retina pictures? Let’s say my default picture width is 1080p but initially my uploaded pictures were much bigger and now I want to use Smush to downsize them. Keeping in mind that I want the retina to be correctly served shoud I choose 2160p as a downscale target (and accept the fact that Smush will get me yellow border on all pictures?). In short: yes, if you want to support retina, you need to have those bigger images. But Smush also integrates with the WP Retina x2 plugin, so you should be good with serving right image sizes depending on the display.